This Is Our Lightweight Aluminium Rollator Which Has Six-Inch Soft Grip Tires Making It Perfect For Indoor Or Outdoor Use. Equipped With A Padded Seat, Curved Backrest And Easy-To-Operate Ergonomic Hand Brakes, This Rollator Will Assure U Comfort And Safety. 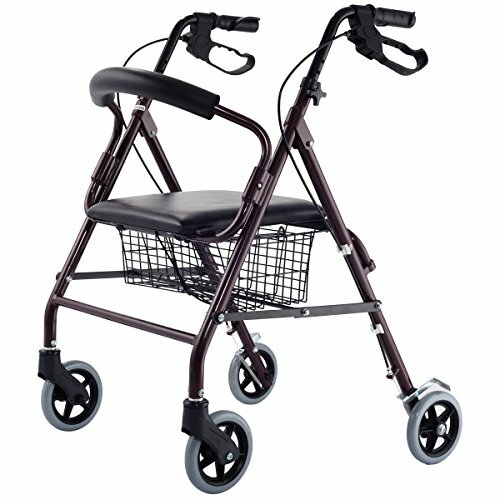 Besides, The Height Of This Rollator Can Be Adjusted According To Your Needs And U Can Fold It For Easy Storage And Transport. Basket Dimensions: 18" (L)X10"(W)X10.2"(H) ,Seat Dimensions: 14"X14"
Seat Height: 20" ,Wheel Diameter: 6"
View More In Rollators & Walkers.